To celebrate the 10 years anniversay of Packt Publishing, all of the available ebooks on Packt Publishing are available at $10 with no limit per client. In 10 years, Packt Publishing has published more than 200 titles. Throught its Open Source Project Royalty Scheme, Packt Publishing supports Open Source project and already has awarded more than $400'000. If you need something to read or just want to use this occasion to pile some ebooks, don't hesitate to profit from this superb offer. When you build C++ projects with CLang, you have the choice between using the stdlibc++ that is provided along G++ and the new libc++ that is provided by CLang. libc++ is another implementation of the C++ Standard Library. This implementation is dual-licensed under the MIT license and UIUC license. It is especially targeting C++11 and has already 100% support for C++14. This last point is the reason that I use libc++ on several of my projects. Moreover, it is also the default on Mac OS X. The problem with linking with another library is that you can only works with libraries that have been compiled with libc++ support. For instance, if you want to use Boost dynamic libraries, you'll have to compile Boost from sources with libc++. For one of my project, I'm using OpenCV and libc++. To simplify the installation of OpenCV, I created a new ebuild with a libcxx use flag to selectively build the library with libc++. This requires LLVM/CLang on the build machine. Moreover, by default, the Gentoo ebuild does not have support for building the static libraries. The reason for that is that OpenCV build is not able to build dynamic and static libraries. I added a static-libs use flag that build the static libraries by building OpenCV a second time after the first. That will likely double the compile time (unless ccache is used). Anyhow, it is simple easier than to build that by hand on several machine. For now, I have created an ebuild for opencv-2.4.8-r1. If someone is interested in other versions, I'd be glad to create new ebuilds. I hope that this ebuild will be helpful. In the Software Analysis Tools, I present three tools: cppcheck, Valgrind and the Clang Static analyzer. Several examples are presented for each tools as well as some recommendations for using them. A short presentation of SonarQube is also performed. The source code for the examples is available on Github. This command gives you two dates for each wish in your list. The first is the date wating for each yearly objectives to be fullfilled. The second one considers only the monthly objectives. For now on, no estimation of expenses is made for the future months. It means that the estimation is made as if there were no expenses in the future months. I'll try to improve that by considering averages of expenses in the previous months to make it more reliable. Still on the wish module, you can now mark your wishes as paid instead of deleting them. This helps you keep track of the prices of your wishes. This is done with the budget wish paid id command. Finally, the totals of the unpaid wishes and of the paid wishes is displayed in budget wish list. Of course, you can also still set the date manually. budget versioning save: Commit the current changes with a default message (Update). budget versioning sync: Pull the changes from the remote directory and push the local changes. This will only works if you have already configured your budget directory to use Git. If you have a suggestion or you found a bug, please post an issue on the github project: https://github.com/wichtounet/budgetwarrior. I recently changed my hard disk on one of my servers and I didn't found a simple and up to date tutorial to do that, so I decided to post here how I did it. I do not claim that is the best method, or the easiest or the safest method, but that is the one I used and it worked quite well. You could do it online with LVM, but when changing the boot hard disk, I'd rather be safe. Especially because you need to reinstall Grub on the new hard disk and probably alter its configuration. But, doing it online directly with LVM should work. My server is using LVM and Grub2. You will need a Gentoo Live CD (or DVD, or USB, or any other Linux live installation with the necessary tools). If you do not use LVM, this guide is not for you. Even if I wrote this guide for Gentoo, this is also gonna work with another system as long as you use LVM and Grub2, just use your distribution live cd. Here I will assume /dev/sda is your old disk and /dev/sdb is your new disk. I will also assume that you previous VG was vg0. If it is, you'll have to replace them in the commands. 1. Obviously, shutdown your computer. 2. Install the new hard disk in it. Create the LVM partition on the new disk (/dev/sdb) with fdisk. You have to do that with for LV you have. 5. Remove the old hard disk and use the connector of the old hard disk to connect the new one. 8. You now have switched hard disk. At any point, if something goes wrong, you still have the previous hard disk completely ready at hand. I hope this would useful to some Linux users. 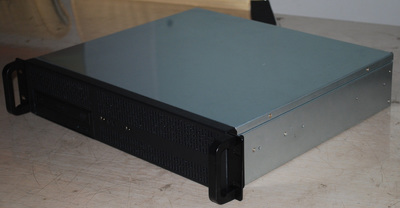 I ordered a new rackmount case for my third server at home. Previously, I only used Norco cases, but the European distributor of Norco (Ri-vier, Netherlands) decided to switch to using its own cases, the Ri-vier cases. Since the shipping fees are very expensive from United States to Switzerland, I decided to stick with Ri-vier for now and try their new cases. I ordered and received the RV-2004 case. This is a 2U case with one 5.25" and 4 3.5". It is a very short case. It looks quite good actually and very like the Norco equivalents. You can put a DVD reader on front. There are also two USB ports and several leds. I really don't like the front panel. There a lot of screws that maintain the front panel. Moreover, the part with the buttons and the LEDs is quite hard to put right and seems of really low facture, I haven't been able to make the LEDs work as of now. The buttons have a kind of plastic cap on them, but it is very hard to make them stay on the buttons when you install the front panel. Finally, there are two fans on the front on their own panel. You can remove the fans, but they are so close together, that most silent fans you will buy won't fit side by side. The three hard disk top cases are removable. In my case, I only left one of them for the SSD. The rightmost one is very hard to pull in and out. I don't understand why there are only three removable cases. The fourth disk location cannot be moved. As with all other cases, it it not very practical to install a SSD in it. I ended up screwing the SSD on top of one of the removable bays. Without any media drive and only one SSD, there are plenty of space inside the case to put the cables. Even with all the bays used, there would probably be some space left under the drive bays. Mouting the motherboard inside the case was really easy, nothing special here. This case is only mountable with RVR-20 rails, not with the Norco RL rails. These rails are really worse than the Norco rails. There are extensible, being in three parts, but the extension is not as good as Norco's. If you extend the rails, you have to mount the rails close to the rear of the case. Moreover, the clip on rails to unblock them does not seem to work on my rails. Fortunately, that is not a case I intend to upgrade in the future, so I should not use the rails extensively. To finish, I would say that I'm kind of disappointed with this case. It really feels worse than the Norco equivalent. I'd rather have Norco cases again. The only advantage it has over the Norco one is being cheaper. 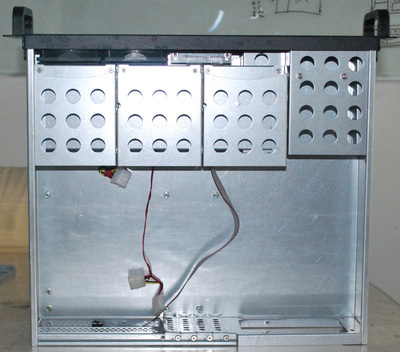 I'm probably gonna go for a Norco case again for my next server. I recently started a bit of work on my compiler (eddic) again. I started by adapting it to build on CLang with libc++. There was some minor adaptions to make it compile, but nothing really fancy. It now compiles and runs fine on LLVM/Clang 3.4 with the last version of libc++. I'm gonna use some features of C++14 in it and I plan to refactor some parts to make it more STL-correct. I also plan to use only CLang on eddic right now, since C++14 support of GCC is not released right now. I decided it was a good time to try again the CLang static analyzer. If, like me, you're using Gentoo, the static analyzer is directly installed with the sys-devel/clang package, unless you disabled the static-analyzer USE flag. If your distribution does not ship the static analyzer directly with CLang, you'll have to install it manually. To install it from sources, I advise you to follow the Official Installations instruction. The usage of CLang static analyzer can be a bit disturbing at first. Most static analysis tools generally takes the sources directly and do their stuff. But that is not how Clang Static Analyzer works. It works as a kind of monitor in top of building the program, using scan-build. When you are analyzing a program, you are also building the program. scan-build works by replacing calls to the compiler by calls to ccc-analyzer . This works generally well, but there are some cases where that things get a bit more complicated. That is the case of CMake where the paths to the compiler are hardcoded in the generated makefiles. scan-build cmake -DCMAKE_CXX_COMPILER=clang++ -DCMAKE_C_COMPILER=clang . This can take a very long time. On eddic, it is about three times slower than a normal compilation. An important point to note about performance, is that you can run compilations in parallel (-j option of make) and that it is supported by scan-build quite well. Once analysis is performed, the found bugs are put into an HTML report. By default, the HTML report is created in /tmp/, but you can specificy the folder with -o option of scan-build. You can enable or disable checker with the -enable-checker and -disable-checker options of scan-build. Several versions of Clang ago, I tried the static analyzer on eddic, but it failed on several source files without producing any results. Moreover, at this time, I don't think there was any nice HTML report at this time. Even if it didn't found anything, this time it worked much better than the last time I checked and the HTML results are just really good. The one thing I missed in Nikola was the lack of Related Posts generation. I solved this during the migration from WordPress to Nikola, by using simple algorithms to generate related posts for each blog post and then display them in the form of a simple widget. For example, you can see the related posts of this post on the left, just under my Google+ badge. In this article, I'll show how the related posts are generated and how to include them in your template. It is important to note that it is necessary to cleanup the content of the files before using it: * First, it is necessary to remove all HTML that may be present in the Markdown files. I remove only the HTML tags, not their content. For instance, in <strong>test</strong>, test would be counted, but not strong. The only exception to that, is that the content of preformatted parts (typically some or console output) is completely removed. * It is also necessary to cleanup Markdown, for instance, parentheses and square brackets are removed, but not their content. Same goes for Markdown syntax for bold, italics, ... * Finally, I also remove punctuation. My related posts algorithm is very simple. First, I compute the Term Frequency (TF) of each word in each post. The number of times a word is present in a document is represented by tf(w,d). I decided to give a bigger importance to words in the title and the tags, but that is just a matter of choice. After that, I compute the Inverse Document Frequency (IDF) of each word. This measure allows to filter words like: a, the, and, has, is, ... These words are not really representative of the content of a blog post. The formula for idf is very simple: idf(w) = log(N / (1+ n(w))). n(w) is the number of posts where the word is present. It is a measure of rarity of a word on the complete posts set. Once we have the two values, we can easily compute the TF-IDF vectors of each blog post. The TF-IDF for a word is simply: tf_idf(w,d) = tf(w, d) * idf(w). Finally, we can derive the matrix of Cosine similarities between the TF-IDF vectors. The idea of the algorithm is simple: each document is represented by a vector and then the distance between two vectors indicates how related two posts are. The formula for the Cosine similarity is also simple: cs(d1, d2) = dot(d1, d2) / ||d1|| * || d2||. d1 and d2 are two TF-IDF vectors. Once the cosine similarities between each document is computed, we can just take the N most related documents as the "Related Posts" for each blog post. With this list, the C++ program simply generates an HTML file that will be included in each post by Nikola template. This process is very fast. I have around 200 posts on this blog and the generation takes about 1 second. Once the HTML files are generate, they are included into the website by altering the template and adding their content directly into the web page. Here is the code I use in base.tmpl. related_path = related_dir + post.source_link() + ".related.html"
You could also display it in post.tmpl as a simple list. The code for the generator is available on the Github repository of my website. I wrote it in C++ because I don't like Python a lot and because I'm not good at it and it would have taken me a lot more time to include it in Nikola. If I have time and I'm motivated enough, I'll try to integrate that in Nikola. I hope that could be useful for some people. As you're reading this post, the site has been migrated from WordPress to Nikola and is now hosted on Github. Nikola is a static site generator. I was getting tired of WordPress. It not a bad tool, but it is becoming heavier and heavier. I think that one of the biggest problems is that you need tons of plugins to make a fully-functional blog. I had more than 20 plugins. And each time you upgrade WordPress, you run into problems with the addons. In my opinion, while I understand why you need plugins for syntax highlighting for instance, you should not need any plugin for performances or security. Moreover, when you think of it a blog is not dynamic, I write less than a post a week and most bloggers write about once a day, in the computer science's sense, it is not dynamic at all. So why bother with a database ? I wanted to use my favourite tools for modifying my blog: the shell and vim. I don't think that wysiwyg editors are really adding any value to editing. I am faster writing posts in vim than I'm in a web editor. I wanted to be able to edit my website offline. With a static generator, as long as you have the files on your computer, you can edit your site and even browse it offline. You can then deploy it on the internet later when you are online. I wanted to host my blog at Github Pages, for fun! Moreover, I had some uptime issues with my host with quite some downtime in the last months. And it saves me some bucks each year, at least it was not a strong factor. It has been several months already since I started thinking about migrating my blog. I had quite a hard time to find a suitable blog generator. Fast: I didn't wanted to spend a long time generating the website. The problem is that there are tens of static site generator. I considered several of them. The most well known is Jekyll. It really looks fine, but I have to say that I HATE Ruby. I think it is an horrible language with an even more horrible environment. I cannot even have Ruby installed on my computer. So I didn't spend a long time considering Jekyll. I also considered Hyde, which is the evil brother of Jekyll, but I think that it was missing documentation to be completely usable for me. I also though of Pelican, but I was not convinced with it. I don't know how, but at first I didn't found about Nikola. It was only after some time that I came across Nikola by pure luck. Once I came accross Nikola, I directly was convinced by it. Nikola is written in Python and has a large set of features but still keeps the whole think very simple. Generation of the website is pretty fast. Even though I don't like Python very much, I'm able to stand its environment and if necessary I can hack around a bit. I also considered Hyde, which is the evil brother of Jekyll, but I think that it was missing documentation to be completely usable for me. I also though of Pelican, but I was not convinced with it. I don't know how, but at first I didn't found about Nikola. It was only after some time that I came across Nikola by pure luck. Once I found about Nikola, I directly was convinced by it. Nikola is written in Python and has a large set of features but still keeps the whole think very simple. Generation of the website is pretty fast. Even though I don't like Python very much, I'm able to stand its environment and if necessary I can hack around a bit. So I decided to try the complete migration. Once I decided to migrate to Nikola, I directly started by importing my WordPress site into a Git repository. This process is quite simple, you just have to export and XML dump from WordPress and then import it into Nikola with the *import_wordpress" command. This already downloads the necessary images and resources and create posts and pages corresponding to your site. It also generates some redirections from the old URL scheme to the new one. As syntax highlighting was done by a plugin, I had to convert it to Markdown myself. This was quite easy, just a matter of sed. I was not satisfied with the default templates so I enhanced it myself. As I'm a very poor web developer and even poorer web designer, it took me a long time, even if it is a simple one. I wanted to add some visibility to the comments, so I used Disqus API to create Most Popular and Recent Comments widgets. I had to create some redirections by myself for the tags and categories. This was again just a matter of simple shell commands. I filled a bug about it so it'll probably be fixed in the near future. Finally, I really missed the options to have related posts generated for each posts, so I hacked a simple way to include them for each posts. The related posts are generated using a very simple algorithm. I'll soon write a post about how I have done this. Except from these things, it hasn't been too hard to migrate to Nikola. Until now I'm really satisfied with Nikola and I hope this will motivate me to write more blog posts in the coming months. I hope you'll find the website as enjoyable as before (or even more :) ). If you are interested, you can read the source of this blog post. Even though I tried my best to avoid 404 or problems with the new site, I'm pretty sure there will be some issues in the following weeks. If you happen to found a dead link or some part of the website is not working for you, don't hesitate to comment this post and I'll my best to fix it. If you have suggestions on how to improve the site or have a question about the process of migrating a website from Wordpress to Nikola, I'd be glad to answer you. I'm pleased to announce the release of another budgetwarrior release, the version 0.3.0. This version contains several important changes. The diagnostics tells you where the money will be taken: On savings, on year savings or on month savings (ideal case). It also checks the objectives to see if the payment doesn't break the fulfillment of some of them. For complete diagnostics, it is necessary to you register your fortune (budget fortune check), ideally once a month. When you make an error when creating a new item (expense, earning, ...), the tool now lets you retry without losing what you typed before. Confirmation messages are now shown after each modification command (delete, add and edit). The license has been changed from Boost to MIT. The sense is almost the same, but the MIT is more well known and I thought it would be easier for people to know what this means. There have several changes to the code base, but that doesn't impact the usage of the tool.